The 2006 UEFA Champions League Final was an association football match between Barcelona of Spain and Arsenal of England at the Stade de France in Saint-Denis, Paris, France, on Wednesday, 17 May 2006. It was the final match of the 2005–06 season of Europe's primary cup competition, the UEFA Champions League. Barcelona were appearing in their fifth final, having won the competition once in 1992, and lost the other three finals. Arsenal were appearing in the final for the first time and in doing so became the first club from London to feature in the final. Each club needed to progress through the group stage and knockout rounds to reach the final, playing 12 matches in total. Barcelona won their group and progressed to the final after beating Chelsea, Benfica and Milan, respectively. Arsenal won their group to move into the knockout stage, and progressed without conceding a goal against Real Madrid, Juventus and Villarreal, respectively. A crowd of 79,500 watched as Jens Lehmann was sent off early in the game. Despite this setback, Arsenal took the lead through Sol Campbell towards the end of the first half. The game turned with the 61st minute introduction of Henrik Larsson as a Barcelona substitute. Larsson provided two assists, one each for Samuel Eto'o and Juliano Belletti. The 2–1 victory was Barcelona's second triumph in the competition 14 years after they won the European Cup in 1992. Teams qualified for the Champions League group stage, either directly or through three preliminary rounds, based on both their position in the preceding domestic league and the strength of that league. Both Arsenal and Barcelona entered the competition in the group stages: Arsenal by finishing second in the 2004–05 FA Premier League, and Barcelona by winning La Liga. The group stages were contested as eight double round robin groups of four teams, with the top two qualifying for the knockout stages. Knockout matches were decided based on home and away matches, with the away goals rule, extra time and penalty shootouts as tiebreakers if needed. UEFA awarded the right to host the final to the Stade de France in Saint-Denis after considering its merits in terms of capacity, stadium infrastructure and dossiers including city and airport agreements and promotional plans. UEFA also conducted a variety of site visits. The Stade de France previously staged the 2000 UEFA Champions League Final between Real Madrid and Valencia, which Madrid won 3–0 and was the first time two clubs from the same country had faced each other in the final. Saint-Denis was chosen to host the final in recognition of the 50th anniversary of the first European Cup final in 1956, held in nearby Paris at the Parc des Princes, now home of Paris Saint-Germain. The Parc des Princes also hosted the 1975 and 1981 European Cup finals, the 1978 and 1995 UEFA Cup Winners' Cup finals, and the 1998 UEFA Cup Final. Barcelona were to show the match live from their Mini Estadi on a 70-metre (230 ft) television screen for an estimated audience of 15,276. Before the final an estimated 1.2 million people converged on to the streets of Barcelona, as the team toured the city on two open-top double-decker buses to celebrate winning La Liga. Arsenal went into the match with the record for the longest time without a conceding a goal. They had gone 919 minutes without conceding since conceding against AFC Ajax in the group stages. Arsenal were featuring in their first European final six years to the day since their last final. They faced Galatasaray in the 2000 UEFA Cup Final; the match had finished goalless after 90 minutes and extra time. Arsenal lost the subsequent penalty shootout 4–1. Of the players who featured in that final, only Thierry Henry and Dennis Bergkamp remained at the club, whilst Sylvinho, who had featured for Arsenal in the final, was now a Barcelona player. The 2006 final was the first time that Arsenal had reached the showpiece match; in doing so they became the first club from London to feature in the final. Barcelona were appearing in the final for the fifth time; their last appearance had been in a 4–0 loss to Milan in 1994. Two more losses preceded the 1994 final (1961 and 1986), and their only success in the competition came in 1992 when they beat Sampdoria. Barcelona went into the final as domestic league champions, having won La Liga a fortnight earlier. They were regarded as being the best side on the continent because they possessed players such as Ronaldinho and Samuel Eto'o. Barcelona player Deco dismissed the notion of Barcelona being favourites, insisting they would not be complacent: "Milan were winning 3–0 last year against Liverpool and ended up losing in the end. We need to be serious, calm and fully concentrated so that we don't make any errors". Neither side had been beaten en route to the final, with Arsenal only conceding two goals in their 12 matches before the final, including a record ten successive matches without conceding. Barcelona, on the other hand, had scored 114 goals in all competitions before the final. The two finalists were guaranteed a financial windfall from their progress to the final. Arsenal would receive a revenue of around €37.3 million if they won and approximately €34.7 million if they lost. Barcelona would earn €31.5 million from revenue if they won, and around €28.9 million if they were to lose. Included in the total for participating in the final, the UEFA Champions League winners would collect approximately €6.4 million, with the runners-up receiving approximately €3.8 million. The final marked the appearance of a new trophy following Liverpool's triumph over Milan the previous year. As Liverpool won the competition for the fifth time they were entitled to keep the trophy, creating the need for a new trophy. Barcelona were expected to line up in a 4–2–3–1 formation, with Ronaldinho, Ludovic Giuly and Deco supporting Samuel Eto'o who would be deployed as the lone striker. They had doubts about the fitness of Lionel Messi going into the final. He had pulled a thigh muscle during the second leg of their match with Chelsea, and had not played since, though he was included in the 22 man squad for the final. Barcelona coach Frank Rijkaard stated he would leave it late before deciding whether to select him. Despite being included in the squad Messi did not feature in the final. Arsenal were expected to line up in a 4–5–1 formation, with Thierry Henry as the sole striker. There was much discussion about whether José Antonio Reyes would take the place of Robert Pires on the left of midfield. It had been announced before the match that this would be Pires' last match as he had agreed to join Villarreal next season. On the morning of the final it emerged that the assistant referee for the game Ole Hermann Borgan had posed for photographs in a Barcelona shirt for Drammens Tidende, a Norwegian newspaper. After initially sticking by the official, UEFA eventually decided to replace him with fellow Norwegian Arild Sundet. Norway's head of refereeing Rune Pedersen stated that "It is an unwritten rule that referees should not do anything that can doubt their impartial stance". Barcelona fielded a 4–3–3 formation with Mark van Bommel and Edmílson lining up in midfield alongside Deco, ahead of Xavi and Andrés Iniesta. Lionel Messi did not feature in the match day squad, despite returning from injury and featuring in the 22-man squad, whilst Henrik Larsson in potentially his last game for the club was among the substitutes. Arsenal fielded a 4–5–1 formation, which saw Emmanuel Eboué replace the injured Lauren, and Ashley Cole return at left-back to make only his third appearance in the competition that season due to injury. Thierry Henry was deployed as the lone striker, with Freddie Ljungberg playing off his shoulder. As both teams' first-choice kits featured a shade of red, Arsenal wore their yellow away strip, while Barcelona wore their traditional blue and maroon striped kit. Arsenal won the coin toss and Barcelona kicked off. Barcelona almost immediately came under pressure when Thierry Henry shot straight at Barcelona goalkeeper Víctor Valdés, who conceded a corner. From the resulting corner Arsenal had another chance again courtesy of Henry, whose shot was again saved by Valdés. The next attack in the seventh minute resulted in Arsenal goalkeeper Jens Lehmann saving from Ludovic Giuly after he shot from a narrow angle. Four minutes later Barcelona were awarded a free-kick 35 yards (32 m) from goal; Ronaldinho subsequently shot wide of the goal. With 18 minutes played, Lehmann became the first person to be sent off in a European Cup final after he brought down Samuel Eto'o outside the Arsenal box. Giuly subsequently put the ball in the back of the net, but the goal was not allowed due to the foul. Arsenal subsequently substituted Robert Pires for Manuel Almunia, their substitute goalkeeper. The free-kick was sent wide by Ronaldinho. Following Lehmann's dismissal Barcelona began to exert more pressure on Arsenal, to the point where Emmanuel Eboué was cautioned for a high tackle. In the 37th minute Arsenal overcame their numerical disadvantage to score when Sol Campbell headed in from a free-kick following Carles Puyol's foul on Emmanuel Eboué, although some observers believed that Eboué appeared to dive. Arsenal held onto their lead for the remainder of the half, as Barcelona's best chance came courtesy of Eto'o, whose shot hit the post via a save from Almunia. Barcelona replaced Edmílson, who had picked up an injury in the first half, with Andrés Iniesta for the second half in an effort to equalise. The period immediately after half‑time saw few chances, but after six minutes of the second half Iniesta had a shot saved by Almunia. After 61 minutes with Barcelona still losing 1–0, Henrik Larsson joined the fray as a Barcelona substitute for Mark van Bommel. Minutes later, Alexander Hleb received a pass from Henry but shot wide of the goal. Arsenal began to press forward and both Henry and Freddie Ljungberg saw shots saved; Henry then had another chance to score after being put through by Hleb, but he shot straight at Valdés. Following this attack Oleguer was replaced by Juliano Belletti, and Arsenal responded by replacing Cesc Fàbregas with Mathieu Flamini. Next, Iniesta sent a pass through the inside-left channel to Larsson whose one touch, right foot lay-off quickly released Eto'o to equalise for Barcelona. Four minutes later Belletti passed through the inside-right channel to Larsson. After controlling the ball, Larsson made a left footed return pass to Belletti. 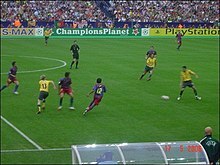 Belletti ran onto control the ball with his left foot. He then used his right to shoot through Almunia's legs to score at the near post. This was Larsson's second assist for Barcelona since he joined the game. The remaining minutes saw Arsenal replace Hleb with Reyes in an attempt to equalise, but Barcelona had the best chance during this period, only for Giuly to hit his shot straight at Almunia. Following this, Larsson impeded the Arsenal goalkeeper and was cautioned as a result. The match finished soon after with Barcelona winning 2–1. Barcelona captain Carles Puyol collected the trophy from UEFA president Lennart Johansson as Barcelona celebrated their second European Cup triumph. As a result of winning the UEFA Champions League, Barcelona would face Sevilla, the winners of the UEFA Cup, in the UEFA Super Cup. The subsequent match, played on 25 August 2006, was won 3–0 by Sevilla. Barcelona's victory meant they would also participate in the FIFA Club World Cup. Receiving a bye in the first round, they beat Club América 4–0 in the semi-finals to progress to the final where they faced Copa Libertadores champions Internacional, who won 1–0. Much of the discussion after the match centred around referee Terje Hauge's decision to send off Lehmann. Football pundit Mark Lawrenson stated: "The game changed when Arsenal goalkeeper Jens Lehmann was sent off". Arsenal manager Arsène Wenger agreed: "When Jens Lehmann got sent off, that left us with 70 minutes to play with ten against eleven, against a team that retains the ball very well". He refused to openly criticise this decision, although he did criticise the decision to award Barcelona's first goal, as he felt that Samuel Eto'o was offside. Wenger was also adamant that his young side would bounce back from the defeat. One person who did criticise the referee was Thierry Henry, stating: "I was kicked all over the place. I expected the referee to do his job. I don't think he did". There was much discussion after the match over whether Henry would remain with Arsenal or move to Barcelona, whom he had been linked with a move to over the past months. Arsène Wenger was asked post match if Henry would leave, to which the Arsenal manager replied: "I don't know. I don't think so". However, on 19 May, Henry signed a new four-year contract with Arsenal, ending the speculation about a possible move to Barcelona. Thierry Henry paid tribute to Larsson's contribution to Barcelona's win after the game, saying, "People always talk about Ronaldinho, Eto'o, Giuly and everything, but I didn't see them today, I saw Henrik Larsson. He came on, he changed the game, that is what killed the game. Sometimes you talk about Ronaldinho and Eto'o and people like that; you need to talk about the proper footballer who made the difference, and that was Henrik Larsson tonight." Henry also remarked, "You have to remember that Barcelona is a team. It's not Eto'o, it's not Ronaldinho. On Wednesday, the man who made the difference was Henrik Larsson. You have to give him credit for that because when he came on he made some amazing runs around the box and he showed he is a team player. You saw two times he fed the ball back to people and that's what I always talk about, he is a team player. He did that against us, even though the first goal was a close offside decision." Larsson's addition giving Barcelona the cutting edge required to overcome Arsenal was noted by international press. Henrik Larsson, who provided the two assists for the goals, was delighted with the triumph and had no regrets over deciding to leave Barcelona after the match: "I want to play football. I feel I haven't played as much as I would love to because of the great players we have at Barcelona". Fellow Barcelona player Giovanni van Bronckhorst was emotional as he won against his former club: "It's special to win the final, and even more special to do it against your old team". Samuel Eto'o, scorer of Barcelona's first goal, cited Liverpool's comeback against Milan as inspiration for Barcelona's victory: "After having seen what Liverpool did last year, we told ourselves not to throw in the towel. We followed Liverpool's example". Barcelona manager Frank Rijkaard praised the role of goalkeeper Victor Valdés in their victory, stating that he made a number of important saves to keep them in the match: "Valdes played a decisive role. He saved us at crucial moments". ^ "2. Finals" (PDF). UEFA Champions League Statistics Handbook 2014/15. Union of European Football Associations. 2015. p. 10. Retrieved 12 July 2015. ^ a b c "Tactical Line-ups – Final – Wednesday 17 May 2006" (PDF). UEFA.com. Union of European Football Associations. 17 May 2006. Retrieved 26 November 2006. ^ a b ""Amazing Larsson made the difference" Arsenal.com". Archived from the original on 9 August 2016. Retrieved 23 July 2016. ^ a b http://in.rediff.com/sports/2006/may/18champs1.htm "Barca inherit 'dream team' mantle"
^ "Regulations of the UEFA Champions League 2006/07" (PDF). UEFA. March 2006. pp. 7–9: §§1.01–1.02 Entries for the competitions. Archived from the original (PDF) on 12 March 2007. Retrieved 16 July 2008. ^ a b "Match Background". UEFA. Retrieved 9 September 2007. ^ "Anniversary reason for Paris decision". UEFA.com. Union of European Football Associations. 28 April 2005. Archived from the original on 8 July 2012. Retrieved 21 June 2010. ^ "Match Press Kit" (PDF). UEFA. 16 May 2006. Archived (PDF) from the original on 17 December 2008. Retrieved 26 November 2008. ^ "Arsenal aim to upset the odds". BBC Sport. 16 May 2006. Retrieved 25 November 2008. ^ "From the 75th Anniversary to the European Cup (1974–1992)". FC Barcelona. Archived from the original on 21 June 2008. Retrieved 28 July 2008. ^ "Barca retain Spanish league title". BBC Sport. 3 May 2006. Retrieved 25 November 2008. ^ a b "Deco shrugging off favourites tag". BBC Sport. 15 May 2006. Retrieved 25 November 2008. ^ "Purists set for dream final". UEFA. 16 May 2006. Archived from the original on 8 January 2009. Retrieved 25 November 2008. ^ "Merseyside revels in Reds victory". BBC Sport. 26 May 2005. Retrieved 25 November 2008. ^ a b Winter, Henry (15 May 2006). "Wenger's pledge gives fans cause for optimism". The Daily Telegraph. London. Retrieved 26 November 2008. ^ Wallace, Sam (18 May 2006). "Arsenal 1 Barcelona 2: Barcelona crush heroic Arsenal in space of four brutal minutes". The Independent. London. Retrieved 27 November 2008. ^ "Final linesman denies Barca bias". BBC Sport. 16 May 2006. Retrieved 25 November 2008. ^ a b c d e f g "Minute by Minute". UEFA. 17 May 2006. Retrieved 9 September 2007. ^ "Tactical line-up". UEFA. 17 May 2006. Archived from the original on 8 January 2009. Retrieved 26 November 2008. ^ a b c d e "Arsenal v Barcelona Live". The Guardian. London. 17 May 2006. Archived from the original on 17 October 2008. Retrieved 26 November 2008. ^ "Referee regrets Lehmann red card". BBC Sport. British Broadcasting Corporation. 18 May 2006. Retrieved 12 February 2011. ^ "Wenger Slams Eboue For Diving". MTN Football. 21 May 2006. Archived from the original on 16 August 2011. Retrieved 11 January 2009. ^ "Barcelona 2–1 Arsenal". BBC Sport. 17 May 2006. Archived from the original on 9 October 2007. Retrieved 26 November 2008. ^ "Champions Final 2006 I Highlights FC Barcelona – Arsenal (2–1) "
^ "Barcelona 0–3 Sevilla". BBC Sport. 25 August 2006. Retrieved 10 August 2008. ^ "Internacional sink Barca in final". BBC Sport. 17 December 2006. Archived from the original on 1 January 2009. Retrieved 30 November 2008. ^ "UEFA Champions League 2010/11" (PDF). Union of European Football Associations (UEFA). p. 206. Retrieved 4 November 2011. ^ "Half time Report" (PDF). UEFA. 17 May 2006. Archived (PDF) from the original on 17 December 2008. Retrieved 27 November 2008. ^ "Statistics". UEFA. 17 May 2006. Archived from the original on 8 January 2009. Retrieved 27 November 2008. ^ "Experts views on Arsenal". BBC Sport. 18 May 2006. Retrieved 28 November 2008. ^ "Valdés save vital to victory". UEFA. 17 May 2006. Archived from the original on 8 January 2009. Retrieved 26 November 2008. ^ "Wenger left frustrated by defeat". BBC Sport. 18 May 2006. Retrieved 26 November 2008. ^ "Furious Henry hits out at referee". BBC Sport. 18 May 2006. Retrieved 27 November 2008. ^ "Wenger hopeful of Henry staying". BBC Sport. 18 May 2006. Retrieved 27 November 2008. ^ "Henry to stay a Gunner until 2010". BBC Sport. 19 May 2005. Retrieved 27 November 2008. ^ "Larsson excited about his future". BBC Sport. 18 May 2006. Retrieved 27 November 2008. Wikimedia Commons has media related to UEFA Champions League Final 2006.